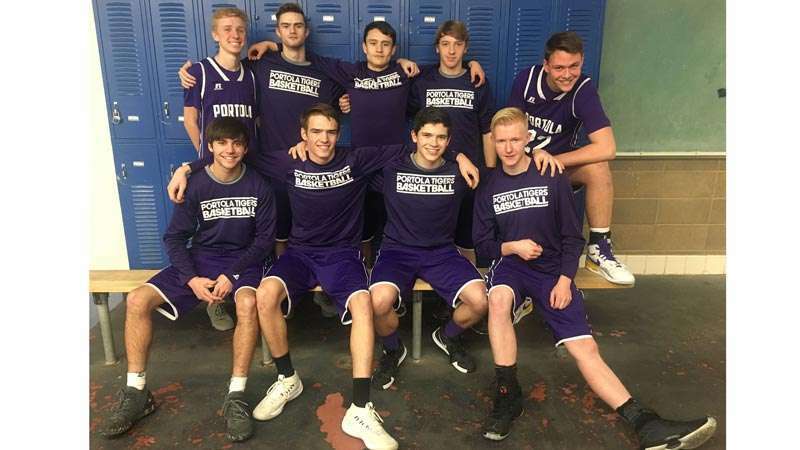 Bringing home the victory for Portola boys from the Quincy home court Jan. 23 were a pair of juniors, JT Massey with 13 Tiger points, and Keegan Folchi with 11 PHS points. A pair of seniors followed; Ricky Johnston scored 7 points and Austin Griffin landed 7. Sophomore Mario Ruiz added 6 Tiger points. PHS players Cody Callahan, Dylan Gonsalves, James Sampson and Owen Bowling all scored for the Tigers. Folchi hit two out of nine 3-pointer shots and Callahan landed one. Folchi hit three out of five free throws. Leading rebounds was Johnston with 15. Folchi picked up eight and sophomore Shane Curren gathered seven. All of the PHS team used their Tiger paws to pick up rebounds, but these three Tigers mean extra trouble for the Trojans as they meet for a rivalry rematch in Tiger territory. The big game starts at 6:30 p.m., Friday, Feb. 1, in Portola. The Portola ladies beat their rivals in Quincy with dramatic scoring that started right out of the gate. With a running start of 20 points in the first quarter the girls just kept on going. They scored 15 in the second quarter. Quincy rallied seriously in the third quarter and even outscored the Tigers, but it was just a blip on the screen as the Tigers went on for a landslide victory by adding 18 more points in the fourth period. Portola girls are in second place in the Mountain Valley League behind Biggs, which boast an undefeated 5-0-league record. Overall, the Wolverines are 18-1 with the only loss being to the Mid-Valley League Hamilton Braves who are also 5-0 in their own league. The Tigers are followed by the Trojans with a 2-2 record in league. The young Trojans grow stronger with every game and the rematch Feb. 1, at 5 p.m. on the Tiger court will be a fun game for fans to watch.